A serviceable account of the star-crossed diva—but it has much competition. 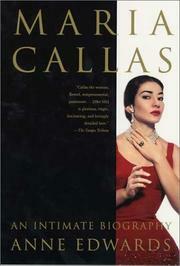 Perhaps the greatest prima donna of them all, Callas rose to stardom despite a horrific upbringing. Evangelia Callas, the stage mother from hell, was determined that her daughter would reap the money and social status that fate had denied her. She alienated Maria from her loving father and pimped Maria’s sister as a mistress. All this was acted out against the terrible backdrop of German-occupied Athens. Evangelia’s determination was not misplaced, however. Maria, although pimply and overweight, showed phenomenal talent from a young age. Owing to excellent training, great intelligence, fine acting abilities, and a limitless capacity for work, Callas eventually became the best-known opera singer in the world. Sadly, she did not enjoy success for long. Her voice deteriorated when still quite young. Manipulated and exploited by many (especially by her lover Aristotle Onassis), her career was over by her mid-40s and she was dead of a drug overdose at 53. Edwards (Ever After, 2000, etc.) tells Callas’s story efficiently and readably. There is, however, a dated, sensational quality to her writing, reminiscent of scandal sheets of years past. She also engages in that hoary British tradition of making fun of the nouveau riches of America, as if Albion has never been graced with that species. An air of sloppiness and haste pervades: needless repetitions of opera plots, and astonishingly poor word choices (she twice confuses “enervate” for “energize,” and she writes that Robert Kennedy’s assassination occurred “at a fund-raising affair”). Or consider this howler: “designer Piero Tosi (named for an ancestral forebear, the seventeenth-century castrato).” Edwards is a storyteller, not a cultural analyst. Once Callas is cremated and the last scandal is dealt with, she gives us a single perfunctory paragraph commenting on Callas’s impact and then ends it, rather like a college term paper written the night before.